Tesla, BMW, Nissan, Honda, Ford, Chevrolet, and soon even Hyundai. Automotive manufacturers all around the globe are electrifying their products in a mad dash to corner the electric vehicle (EV) segment of the motor industry. With this worldwide movement to embrace environmentally-friendly and sustainable transportation, perhaps you’re considering buying an EV of your own. With so many options being offered, many of them still in their infant years,you’re undoubtedly wondering if the cost matches the benefits. In our economy, two most-considered aspects of any car purchase are: what’s the price tag going to be? And, is the cost going to deliver a solid investment? Mojo Motors has taken such questions and compiled a comparison study of the up-front MSRP of multiple EVs and the per-mile range each one delivers. After proudly announcing that after only four months of offering the BMW i3 in dealerships, i3 sales in the United States are 70% higher than Tesla sales (source: BMWblog.com), this independent study reveals that the BMW i3 is actually the most costly EV on the market. Tesla’s Model S, however, sits as the best investment return. 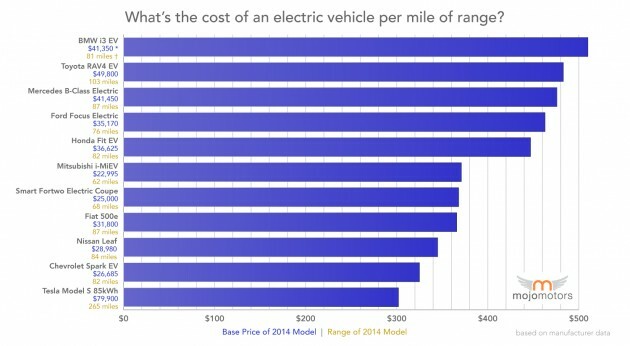 The formula for the analysis of the most expensive EVs is actually quite simple: the Cost Per Mile of Range (CPMR) is calculated by dividing the initial MSRP of 2014 models by the average total mileage each car delivers on a single charge. While the BMW i3 actually has a decent price tag for a BMW, it still sits at $10,000 to $15,000 over other EVs like the Honda Fit, Nissan Leaf, and Chevy Spark. The BMW i8 isn’t on the list, but considering its MSRP surpasses $100,000, it would likely rank even worse than the BMW i3. Another point to consider is that this calculation does not include such aspects as car maintenance costs (especially the pricey battery replacements), the lifespan of the vehicle, and so forth. So don’t put your entire decision in just this one study. 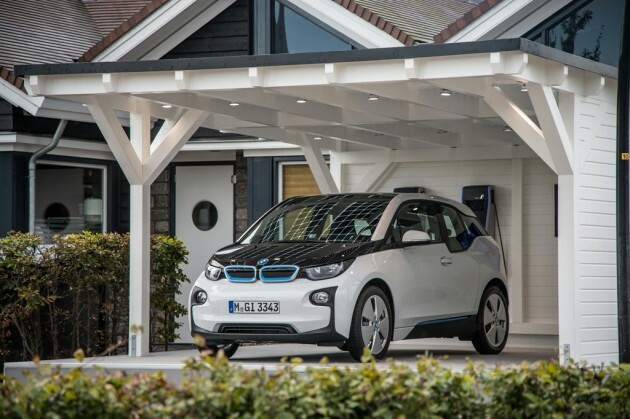 What can be surmised is that there’s clearly a reason Tesla is a hot name in the EV community and that, while still fresh on the block, BMW has a ways to catch up. On the other hand, at least the BMW i3 isn’t being banned from purchases in multiple states. There’s one final question which you’ll be left to answer on your own: At this stage of the EV revolution, is it worth going full electric just yet?